Create an ideal sanctuary to leave the day's troubles behind you with help from this beautiful poster bed. 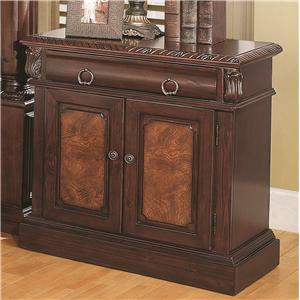 The piece carries a warm brown cherry finish and is crafted from pine solids as well as cherry veneers. 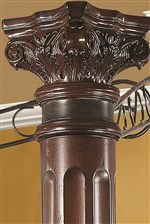 In addition, the intricate carvings and moldings add thoughtful detail while large posts and a black metal scrolled top bring extravagance to the overall look. 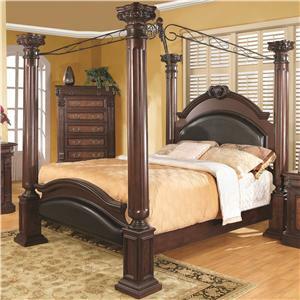 Plus, the gently arched headboard and footboard include faux leather panel. Simply stunning, this poster bed will bring absolute elegance to your bedroom decor. This bed is available in queen, king, and California king sizes. The Grand Prado King Poster Bed w/ Upholstered Panels by Coaster at Value City Furniture in the New Jersey, NJ, Staten Island, Hoboken area. Product availability may vary. Contact us for the most current availability on this product. 202201KEB4 King Poster Bed Box 4 1 0" 0" 0"
202201KEB3 King Poster Bed Box 3 1 0" 0" 0"
202201KEB6 King Poster Bed Box 6 1 0" 0" 0"
202201KEB5 King Poster Bed Box 5 1 0" 0" 0"
202201KEB2 King Poster Bed Box 2 1 0" 0" 0"
202201KEB1 King Poster Bed Box 1 1 0" 0" 0"
Warranty Coaster Co. Of America warrants that its merchandise are free from manufacturing defects (workmanship and/or material)and will either give credit or replace defective parts for a period of up to one (1) year from the date of purchase in accordance with the conditions set forth below. If a manufacturing defect is found, Coaster should be notified promptly of the defect and supplied a copy of the invoice and delivery ticket. Inspection by a Coaster employee or representative may be necessary to verify that a manufacturing defect exists, or you may be required to submit samples to Coaster along with a digital image of the defects. If replacement is required in accordance with this warranty and the defective material or merchandise has been discontinued or unavailable, Coaster reserves the right to select and supply similar merchandise or offer full credit for the merchandise; otherwise the same material or merchandise will be supplied for replacement purposes. 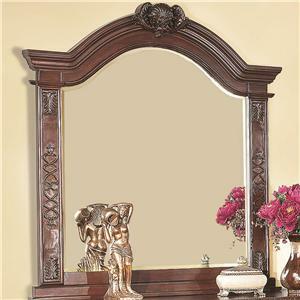 You can make a grandiose statement in your bedroom decor with the Grand Prado collection. 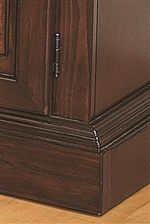 The pieces come in a warm brown cherry finish and are constructed from pine solids as well as cherry veneers, which add to the elegant appearance. 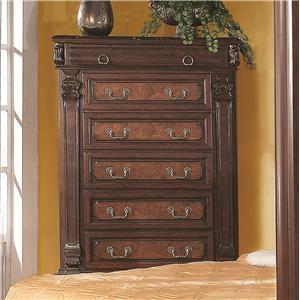 Intricate carvings and moldings run through the entire set while top drawers are felt-lined for your fine jewelry and other valuables. Plus, the multiple storage options are great for keeping sweaters, jeans, blankets, books and bedsheets. With a wealth of detail, the Grand Prado collection is sure to bring stunning style into your bedroom setting. 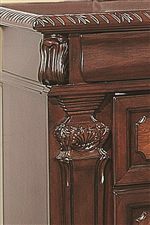 The Grand Prado collection is a great option if you are looking for Traditional furniture in the New Jersey, NJ, Staten Island, Hoboken area. Browse other items in the Grand Prado collection from Value City Furniture in the New Jersey, NJ, Staten Island, Hoboken area.